MWD Alik H218 was a retired Patrol/Explosive Detector Dog (PEDD) that proudly served with Security Forces for 8 years protecting our country and freedoms. 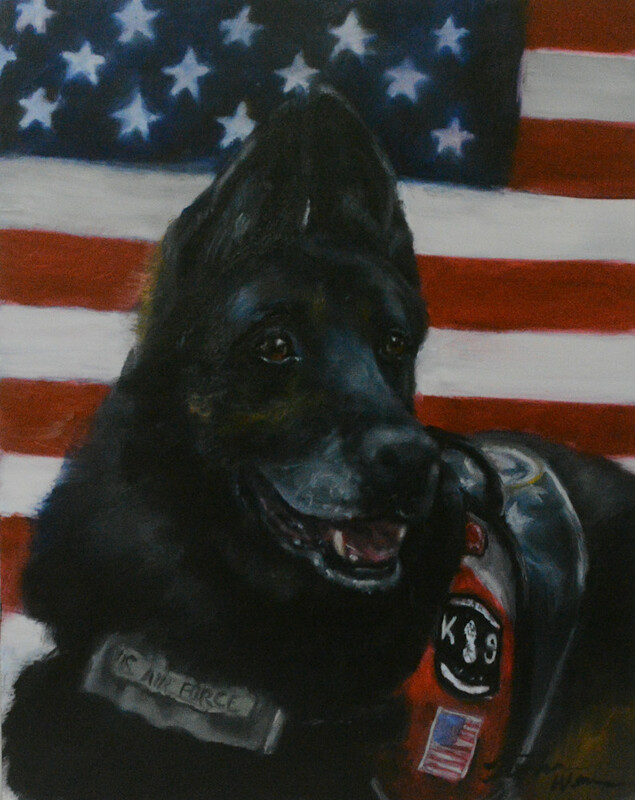 MWD Alik was medically retired in January 2012 at the age of 9 1/2yrs due to a working injury and was adopted from Lackland AFB in San Antonio, TX. Unfortunately, his original adopter decided he did not want him after 1 1/2yrs (his girlfriend didn't like dogs) and left him in a warehouse without air conditioning in San Antonio. He was surrendered to a local rescue and upon medical examination it was found he had a mass on his spleen and a shredded rear tendon that required immediate surgery. Once recovered from the surgeries, the rescuer started searching for a “forever” home for this amazing dog and in August of 2013 we were honored to adopt MWD Alik H218 and provide him with the loving “retirement” he had earned and deserved. From the time he entered our house, he and CWD Carlos literally became the best of buddies and Alik watched over Carlos through his many medical issues. Alik was a big burly boy that looked intimidating however, he had a heart of gold and was so very gentle meeting children. Alik loved life and you could see at times that puppy inside that was full of orneriness. He brought so much laughter to our home. Alik proudly rode on the first float in the NYC Veterans Day Parade that honored our nation's War Dogs. While in NYC, when we would walk down the sidewalk, people literally cleared a path for him. The first time it happened, he turned his head and looked at me with a laughing look on his face. Imagine what went through my mind one morning when a NYC Police car pulled up by the side of us, the officers ask me to stop and then they climbed out of car. I didn't know what we'd done wrong so I said Good Morning as Alik placed himself in front of me. I had to laugh when they said they had pulled over because they wanted to meet my handsome warrior. Alik was an amazing Ambassador for War Dogs and was always smiling. We lost him unexpectedly 6 months (May 23, 2015) after losing Carlos and I know those 2 brothers in paws are inseparable even now. Alik and Boss only knew one another for 2 months before his passing but he welcomed Boss into our home and watched over him as well. An amazing boy! We were truly blessed to have Alik in our lives, home and hearts.